The "Cultivate Climate and Community (3C)" program extends roots planted two years ago. It does weaving complicities with entities and social agents in the environment of the six municipalities where it is present, two in the Madrid and four in Catalonia. Since its inception, the program planted the seeds that sprout now in the form of partnerships with schools, associations of market gardeners, schools with students who require special attention or entities environmental education. "After the start-up period, the orchards are ready to meet new challenges. Production is stable and mechanisms for formation work. 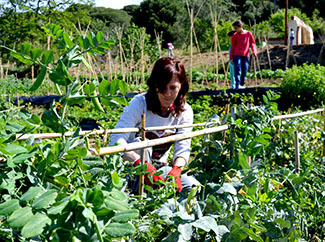 It's time to make the 3C meets one of its vital functions: in addition to generating vegetables grown with ecological criteria must be itself a philosophy that reaches people both sustainability criteria and socially, "he explains the head of program, Damiana Conde. For this reason, the gardens open their doors for visits, exchange knowledge and experience or organize open days. 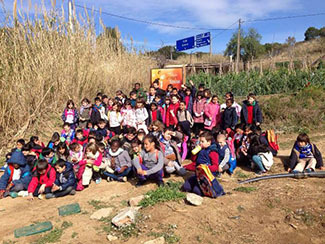 The 3C Calella (Barcelona), social garden "youngest" program, received in March the visit of the Public School La Minerva, specifically were between 80 and 90 children of 1st and 2nd Primary, aged 6 and 8 years. Accompanied by five teachers, they enjoyed with explanations of Albert Amoros, technical agricultural. The Minerva is a Green School. The Green Schools project is promoted by the departments of Education and Environment of the Generalitat of Catalonia initiative, which aims to educate and sensitize students on respect for the environment and the need to preserve the natural heritage and minimize impacts that result from the operation of the center. "We have a garden in the center," explains Professor Marta Ten, "We believe that is very useful for students because you can do many learning activities". The school is also characterized by meet-called "three S" is sustainable, healthy and supportive. Coinciding with the school adheres to the International Year of Pulses, Albert Amoros return visit them and be reunited with students in the school garden. 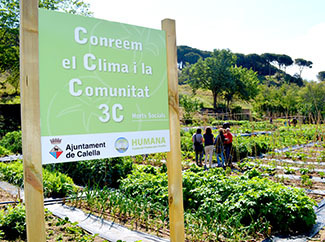 The mayor of Calella, Montserrat Candini, and the Councillor for Social Policy, Margarita Valls and Humana representatives, officially opened on Saturday 14 May 3C garden located in the town of the Maresme, 60km from Barcelona. The event also served to hold an open day, attended by about 30 people, including a dozen activists accompanied by relatives. Montserrat Candini praised the work done by activists and put in value the social profile that has the 3C and close collaboration between Humana and Calella. Meanwhile, the agricultural technician which trains activists in Calella, Albert Amoros, went over the day to day in the orchard and social users also congratulated for their dedication and interest. San Agustin del Guadalix (Madrid), activists have made several visits outside: they were in the garden and hen house in the small town of Redueña; They toured the Museum of Agriculture Torremocha de Jarama and learned to bocashi (it is an organic fertilizer that helps plants in their growth) thanks to the collaboration of the Association for Supported Agriculture Vega de Jarama Torremocha Community. 3C is expected to St. Augustine avails medium term open day for neighbors know about the project. Leganes was held in January, also in Madrid, an open day for the families of activists doors. twenty people, among other activities, they saw a photo exhibition of the evolution of the garden in its two years of existence met. In March, several activists have visited the so-called "Leisure Gardens" driven by the City of Leganés and whose users was hosted.